This article concludes a three-part farmdoc daily series on the 2014 farm bill and U.S. commitments on farm supports under the World Trade Organization (WTO). As noted in farmdoc daily July 30, 2015, the U.S. is unlikely to exceed its current WTO limit on farm support under the 2014 farm bill. In contrast, the U.S. is likely to exceed some limits in the 2008 WTO Doha Round proposal as the 2014 farm bill interacts with the large growth in U.S. crop insurance and changes in its notification at the WTO (farmdoc daily July 16, 2015 and July 30, 2015, respectively). While Doha negotiations are ongoing, nontrivial implications for U.S. farm policy are possible. Costs and WTO notifications for crop insurance and some WTO terms used in this article (Aggregate Measurement of Support (AMS), Current Total AMS (CTAMS), de minimis thresholds, and green box) are discussed in farmdoc daily July 30, 2015. Information on the 2008 Doha farm support proposals are from the WTO negotiating document. For more information and explanations, see Blandford and Orden, and Schnepf. The proposals substantively tighten constraints on U.S. farm policy. The limit on annual U.S. CTAMS would decline from $19.1 to $7.6 billion. Product-specific and non-product-specific de minimis thresholds, below which support does not count toward this limit, would decline from 5% to 2.5%. New restrictive caps on product-specific support would be instituted. A new limit of $14.5 billion would be set on “Overall Trade Distorting Support” — OTDS includes all support not in the green box, including, most importantly, spending less than de minimis levels. Any Doha agreement likely will differ, probably notably, from the 2008 proposals. Not only have markets changed since 2008 but also policy in some countries. Besides the U.S., policy changes in China and India are often highlighted. The Organization for Economic Cooperation and Development (OECD) provides estimates of 2014 support for China but not India. OCED reports China’s 2014 government support payments for agriculture as $53.7 billion, compared to $33.4 billion in 2008. Crop insurance and product-specific AMS caps: The U.S. decision in 2014 to start notifying crop insurance as product-specific support (farmdoc daily July 30, 2015) means the U.S. would likely exceed some proposed Doha product-specific caps solely on the basis of premium subsidies. 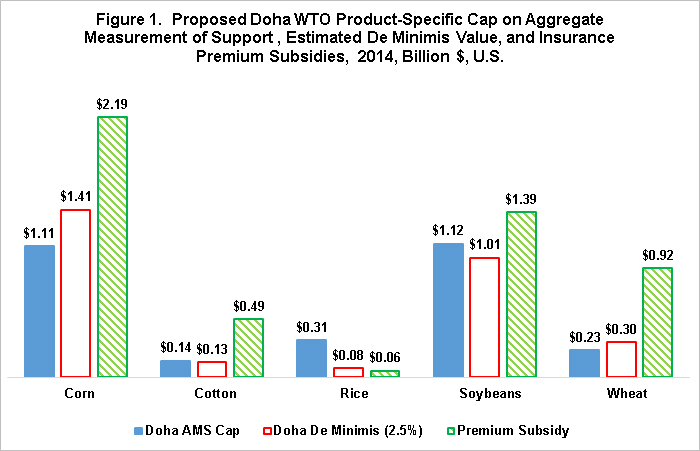 Figure 1 presents for five key crops the 2008 Doha proposed U.S. product-specific caps, estimated 2014 product-specific U.S. Doha de minimis thresholds, and premium subsides as reported by USDA, Risk Management Agency for the 2014 crop. Premium subsidies exceed both the proposed cap and de minimis threshold for corn, cotton, soybeans and wheat. Their 2014 premium subsidies sum to $5.0 billion. Premium subsidies for other crops sum to $1.2 billion, with about half of this cost also exceeding proposed de minimis thresholds. Note that, payments by ARC (Agriculture Revenue Coverage) and PLC (Price Loss Coverage) are not included in these calculations. ARC, PLC and Current Total AMS: As described in farmdoc daily July 30, 2015, ARC and PLC are likely to be notified as non-product-specific support. A key to determining CTAMS compliance is the non-product-specific support de minimis threshold. The Doha proposed 2.5% de minimis and the recent range of $400 billion in U.S. farm production implies a threshold of around $10 billion. For the 2014 crop year, ARC and PLC payments are projected to total $5.7 billion (farmdoc daily August 6, 2015). While ARC and PLC payments may be higher or lower in future years, the projected situation for 2014 suggests that, unless large ARC and PLC payments are made simultaneously for corn, soybeans and wheat, the U.S. is unlikely to exceed the proposed Doha non-product-specific de minimis threshold. In this case, ARC and PLC payments will not count against the CTAMS limit. Current Total AMS Limit: Recent WTO notifications for U.S. sugar have been around $1.5 billion annually. The sugar program is largely the same in the 2014 and 2008 farm bills. Adding this sugar AMS to the AMSs for corn, cotton, soybeans and wheat (because they exceed their proposed product-specific de minimis thresholds) results in $6.5 billion of CTAMS. While below the Doha proposed U.S. CTAMS limit of $7.6 billion, only a little room remains in 2014 for other subsidies that exceed de minimis thresholds. More broadly, if 2014 is representative of years under the 2014 farm bill, this same situation would occur in future years. Overall Trade Distorting Support Limit: OTDS includes all support not in the green box. For the 2014 crop year, $6.2 billion in insurance premium subsidies, $5.7 billion in projected ARC and PLC payments, and $1.5 billion in projected sugar market price support sums to $13.4 billion. While below the Doha proposed U.S. OTDS limit of $14.5 billion, again only a little room exists for increased spending on any program, even if support remains below the de minimis thresholds. Flexibility under new green box rules: One approach to managing a potential breech of WTO limits is to reclassify support into a different category. Proposed Doha changes to the green box criteria may provide two flexibilities. First, crop insurance payments for which eligibility is “determined by a production loss which exceeds 30 percent of the average production in a period demonstrated to be actuarially appropriate” can be classified as green box. This provision may allow U.S. crop insurance subsidies for yield losses greater than 30% to be classified in the green box, thus reducing what is counted against support limits. A second proposed flexibility excludes from CTAMS, payments “that do not require production” if based on 85% or less of a fixed and unchanging base acreage and yields. Such payments would be classified in what is known as the “blue box.” PLC payments likely would qualify for this exemption. PLC payments would still count toward OTDS and would be subject to an overall blue box limit of $4.853 billion as well as product-specific blue box caps. Nothing has been agreed to. In WTO trade negotiations, nothing is agreed until everything is agreed. Everything includes all provisions, whether agricultural or nonagricultural. The 2008 Doha farm support proposals remain a point of reference in the 2015 negotiations, but countries are far apart. A comprehensive agreement seems unlikely this year. Moreover, if an agreement is eventually reached it will likely differ from the 2008 proposals and many provisions will be phased in over several years. The 2008 Doha proposals significantly tighten WTO limits on U.S. support for its farm sector. The large increase in crop insurance subsidies since 2008 likely means the U.S. would exceed some of the 2008 proposed product-specific support limits. This would be the case for 2014 for the key U.S. crops of corn, cotton, soybeans, and wheat. The U.S. may exceed its Doha proposed CTAMS limit due to product-specific support. The U.S. may exceed its Doha proposed OTDS limit due to the large increase in crop insurance, combined with the 2014 farm bill shift to ARC and PLC payments instead of fixed direct payments (which were green box excluded support under the 1996, 2002, and 2008 farm bills). Not being able to agree to its proposed 2008 Doha limits on domestic support makes it harder for the U.S. to obtain more market access for U.S. agricultural products or lower export subsidies and farm support from other countries. A potential implication of the Doha proposals for U.S. farm policy is that it may have to abandon its historical desire to write umbrella policy that applies across crops and replace it with farm policy scripted to individual crops to stay within WTO product-specific limits. Already, the STAX insurance program was written for U.S. cotton in the 2014 farm bill partly in response to the WTO ruling in the Brazilian cotton case. Another potential implication arises because policy in general and the WTO in particular likes to use fixed numbers instead of numbers that move with the market. Unless fixed product-specific limits are carefully calibrated to reflect future changes in markets, binding product-specific constraints could increase the potential for trade distortions across crops. Blandford, D. and D. Orden, "United States" in WTO Disciplines on Agricultural Support (D. Orden, D. Blandford and T. Josling, editors), Cambridge University Press, 2011. Schnitkey, G., and C. Zulauf. "Estimated National 2014 ARC-CO and PLC Payments." farmdoc daily (5):143, Department of Agricultural and Consumer Economics, University of Illinois at Urbana-Champaign, August 6, 2015. Zulauf, C., and D. Orden. "U. S. Crop Insurance Fiscal Costs and WTO Notifications under Current Rules." farmdoc daily (5):139, Department of Agricultural and Consumer Economics, University of Illinois at Urbana-Champaign, July 30, 2015.